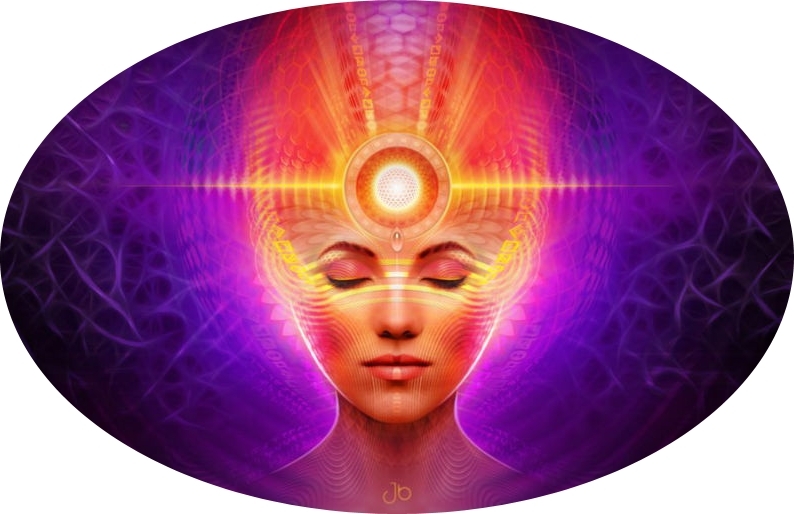 Welcome to our brand new in depth Psychic and Intuition Development Course. The difference with this course is that it not only teaches you step by step how to develop your ‘Clair-senses’ but it also attunes you to powerful Celestial Light Codes to awaken and further enhance your natural intuitive abilities. This course is ideal for absolute beginners as well as those a little further on their path who are in need of a little extra guidance. ‘Clair’ means Clear in French. You may have heard or read about this in your spiritual studies regarding the different psychic senses or abilities we are all naturally born with. These are enhanced multidimensional forms of our everyday physical senses. Many tend to have one ability which is stronger than all of the others, some more than one and for others a smattering of each one. If you have one dominant sense this isn’t to say the others cannot be developed, only that this may happen in varying degrees and over a longer period of time. It tends to be something which if it is intended happens naturally over time and with practise and patience just like learning any new skill. ‘Clair-senses’ are natural abilities we are naturally born with. 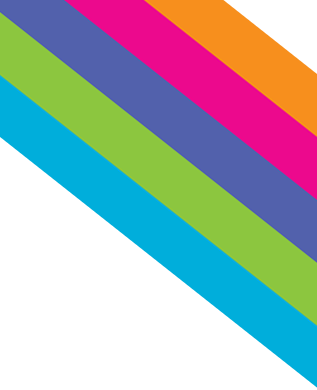 Each module will cover a different ‘Clair-sense’ and it is recommended that a minimum of a month is allowed between every level to give you time to really focus on each important aspect. By the end of the course you will have fine-tuned each of your spiritual Clair-senses. I have also included some of my experiences and some helpful exercises and spiritual development articles to help you on your way. Included in each course module will be a Celestial Light Code Activation Attunement, this will help to open up your perceptions and to gently release any blockages that are preventing you from achieving your full spiritual potential. *If you choose to purchase individual modules it is recommended but not compulsary to have taken the above Flush attunements. 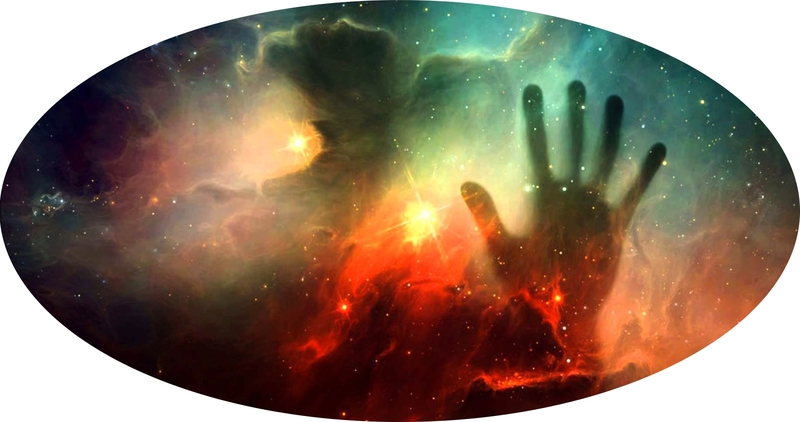 Module 1 – Clairvoyance - £25Clairvoyance means clear seeing. This is the ability to intuitively reach across into other realms and dimensions by altering our vibrational frequency enough that we can create a bridge between our realm and other ones to visually perceive "within the mind's eye" something existing in that particular time and space. This can manifest in varying degrees sometimes to such a stage that it appears as if their realm is overlaid ours and we can easily walk between them both. Those who proclaim themselves as a clairvoyant use their inner vision, the eye behind the eye, to receive these extrasensory impressions, sometimes they appear as if they were happening right in front of them, and other times in the form of symbols. As we are entering into a sacred space we are beyond time so we can see things from hundreds or even thousands of years ago as clearly as if they were happening in our present time, this is known as Postcognition. Others see events yet to occur, known as Precognition. Some just see this unfolding much in the way as if they were watching a movie, as for those who have other abilities they may also then hear, feel, smell or taste their way through their experiences in these realms too. Tuning in is actually a simple and natural process, we often do it without thinking when we enter a daydream state, but to begin with it is more productive to do this while consciously preparing yourself, setting your intention and actively entering into a meditative state. Working with this course material, the the energy will make you far more open and receptive and your experiences far richer and more vibrant. 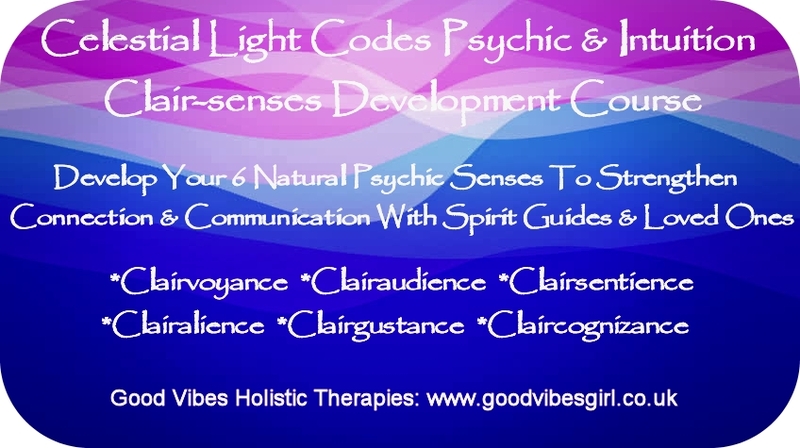 You will recieve your PDF course manual and ongoing email guidance throughout your course, after you have followed the exercises and meditations for one month you may apply for your Celestial Light Code Activation. On completion of this you will receive a certificate of completion. *Please note this teaching course and its energies are unique to GVHT Good Vibes Holistic Therapies, Raine Hilton & Philip Hilton, and cannot be taught by anyone else, or passed onto others. Please contact me goodvibesgirl@live.comto make a booking or for more information. With time and practice clairaudients can eventually receive verbal and sound-related information from people and events in the past, present and future while fully conscious, in a variety of environments such as when working one to one or in groups or circles. Those who actively channel are also known as Mediums, and often work with both clairvoyance and clairaudience abilities. You will receive your PDF course manual and ongoing email guidance throughout your course, after you have followed the exercises and meditations for one month you may apply for your Celestial Light Code Activation. On completion of this you will receive a certificate of completion. *Please note this teaching course and its energies are unique to GVHT Good Vibes Holistic Therapies , Raine Hilton & Philip Hilton, and cannot be taught by anyone else, or passed onto others. Please contact me goodvibesgirl@live.com to make a booking or for more information. Module 3 – Clairsentience - £25Clairsentience means clear feeling. 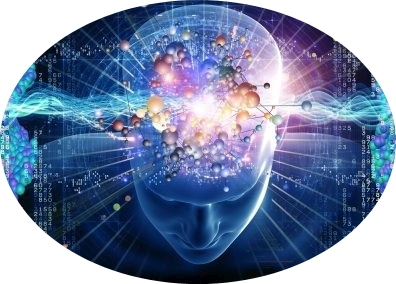 Clairsentience also known as clear sensation or feeling is the ability to perceive psychic information by "feeling" it within the body, without any outer stimuli related to the feeling or information. If you are someone who mostly focuses on how things relate to you physically and emotionally rather than mentally, it could indicate that you are more open to clairsentient messages and information coming into you. You may find that you learn new things more easily in a kinaesthetic manner and perspective, being shown one to one in person, or following a video tutorial, instead of reading instructions from a manual or listening to what someone is telling you. You may be someone who is very intune with your own body and feels all of the subtle, and the not so subtle, energy shifts, planetary alignment changes, phases of the moon etc more keenly than others do. This may make you feel more emotional than usual, disturb your sleeping patterns, or may make you feel more achy in your physical body than usual. We have all experienced what it’s like to walk into a room and feel over-powered by a particular scent. Or what it’s like to feel comforted by the aroma of a favourite home-cooked meal or the scent of a loved one’s perfume or cologne. 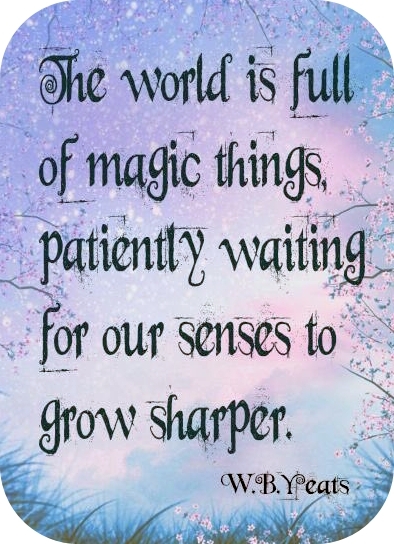 But some people have further developed the psychic ability of Clairalience allowing them to experience scents and aromas that others don’t smell, that are not of this physical world. Not every person will associate smells with particular people, others find that they are more affected by particular situations. For example, there have been cases of people who say they smell the emotions of others. One might notice a particular scent when someone is angry and another scent when one is calm and yet another scent when one is happy, sad, in fear or aroused. In this case it’s up to the person with the psychic ability to figure out how to interpret the messages they are getting with their sense of scent. There are others who say that they can sense the energy or the vibes of someone else through their sense of smell. For example, when they come across a person giving off good vibes, they experience a pleasant scent, but when they come across a person giving off bad vibes, the odour is not enjoyable. Again, these scents and aromas you’re picking up are unique to you. If others smell the same thing, then chances are the odour is literal and not psychic. If you have the gift of Clairalience, you can strengthen it by paying attention to it and actively using it. The more you notice what you smell and when you smell it, the more you’ll understand how your particular ability works. 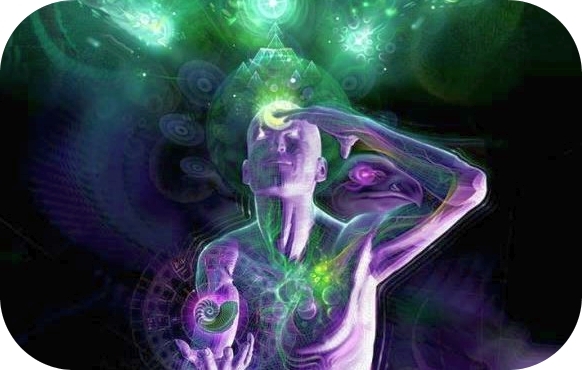 If you intuit information and then act upon it, your psychic ability will naturally get even stronger. Spirit will often use scents to identify themselves or something that perhaps they used, ate, or were surrounded by to strengthen their energy signature. This form of spirit communication allows them to use energy and convert that into a scent for us to smell in the form of spirit communication. Working with other people; how to discern their overall auric scent from their physical scent. This is the ability to be to taste something that isn't present in your immediate physical/material environment. This can often happen quite unexpectedly, for example, when we apart from someone who is very emotionally close to us, or when a loved one has passed over and we are thinking of them, and they are visiting us. When it is someone who is apart from us in a physical sense, for example another city or country, we may suddenly have a sense of what they are eating or drinking, and be able to taste it as if we were eating or drinking it ourselves. When this happens from someone who has passed over they often utilise this ability as a way of reminding us of something which we knew they particularly enjoyed in life, or to remind us of a special occasion we shared with them. Exercise 4: Associating different tastes with individuals;living and in spirit. Please contact megoodvibesgirl@live.comto make a booking or for more information. This is when we experience advanced knowledge of people or events that we would not normally have access to at this time, or in some cases at all. These important messages filter through to us from Spirit and may suddenly simply appear in our minds like a bright flash of inspiration. Sometimes they may form a sense of gentle inner knowing, providing us with the urge to change direction on where we are going, what we are doing, or to share information that doesn’t come from our own thoughts and impressions with others. You will have experienced many of these moments quite naturally. Have you ever thought to yourself; “I don’t know why I left so suddenly, I just knew I had to get out of there.” Or, “I don’t know what it is about that person; I just know I don’t trust them.” Or, “I just knew something was going to go wrong today.” If you were questioned you would say that there was no rhyme or reason, no logic you can point to, no information gained through regular channels. Just pure knowledge downloaded directly into your brain with no interpretation required, and no room for misunderstanding. When we are open to these possibilities we actually attract more of them to us because we are not self-limiting ourselves by only the things that are measurable to us in the physical world. Learn two powerful techniques to help guide you through the out of body experience. Exericse 4: Work with a friend on 3 ESP techniques: Zener cards, hidden objects, and words and images telepathy.